Chris Gayle breezes to a 100 in 30 balls! Bangalore, April 23, M. Chinnaswamy stadium, it was a Tuesday and Chris Gayle put on a display of fireworks with 6’s and 4’s throughout the evening. Chris Gayle is the star opening batsmen for Royal Challengers Bangalore and a match doesn’t seem to go past without Chris Gayle hitting a six! It’s a rarity to see him not hit a six! 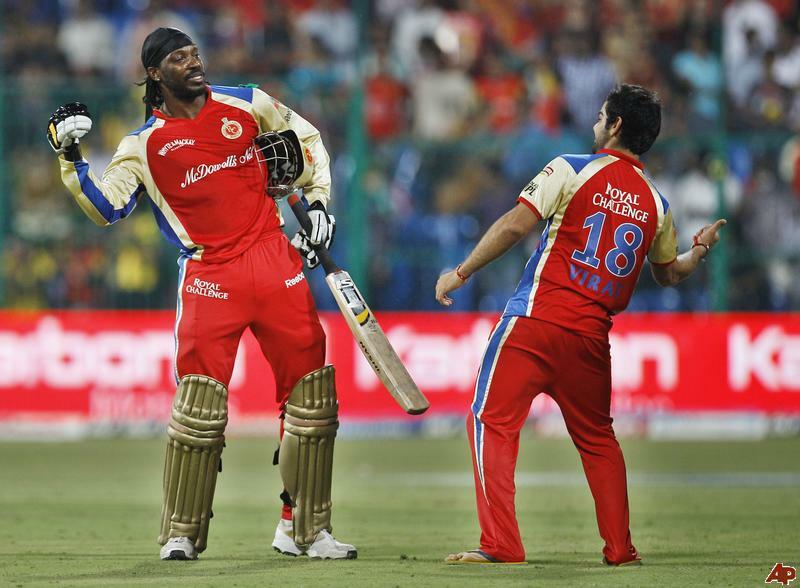 The match against Pune Warriors saw Chris Gayle quick fire his way to a century in 30 balls! He also received the accolade for highest score of 175 in 66 balls. His innings, was one that saw him from the very beginning to the very end not out (20. overs), and the middle of his innings saw 17 sixes! and 13 fours! The Royal Challengers Bangalore reached 263 for 5, thanks to the one man show, and the ‘team’ received the fastest Indian Premier League hundred too. The experienced and collected batting showed a huge range of Gayle’s repertoire of shots, my favourite shot was his six to reach his hundred and he hit the roof with his powerful shot! In celebration and to thank the crowd, Gayle took off his helmet and then with a smile hugged his partner Dilshan and then went down on his knees with a wider smile and raised his bat to the crowd! Chris Gayle is a remarkable showman and 81% of people in a vote believed that Gayle would make his hundred, well he sure as well did! The excellent West Indian cricketer is now number one in the most runs scored in the IPL 2013 with 566 runs followed by M Hussey who is on 504, and then comes RG Sharma an Indian who is number three with 414runs. The match was interrupted at one point, by a beautiful feat of mother nature, a torrential down pour, and then resumed again after 30 minutes for Chris Gayle to demonstrate the beauty of Cricket in 30 balls. The previous record for fastest IPL hundred was made by India’s Yusuf Pathan’s who made a century in 37 balls in 2010. 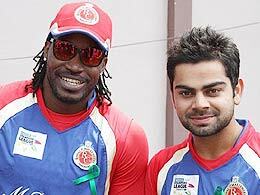 Gayle also set the latest IPL record for the fastest 150 in 53 balls and was to thank for beating the previous 246-run record of Chennai Super Kings (CSK) against Rajasthan Royals in 2010, Virat Kohli the Royal Challenger Bangalore captain must have felt relieved to be on the side that was batting with Gayle as they watched him dispatch every bowl that was pitched in to him from seven different bowlers. The Pune Warriors tried to slow Gayle down at one point with the introduction of spinners, this however did not stop the sixes or fours or Gayle from breaking the records mentioned above. Pune Warriors captain Aaron Finch had won the toss and elected to bowl, possibly they didn’t know that Chris Gayle was in such fine form. The fielders were faced by the pace of every shot coming from Gayle’s bat and he hits many shots, if not all of them, very hard and fast. « Dabaang! ‘Being Human’ – Salman Khan’s ‘Charity’ – To Make Film – Katrina’s younger sister to DEBUT!